“I have lots of new ideas that would please you enormously (…) I'm greatly enjoying working (…) As you can see, it’s no longer anything like Rodin (…)” These few lines from a letter written by Camille Claudel to her brother in December 1893 reveal her current state of mind. 1893: Camille Claudel distances herself from Rodin and isolates herself in her work, exasperated by even the most laudatory critics, who hasten to connect her work with that of her master. She would never cease to distance herself, to underline her uniqueness and autonomy. She embarks in new directions and begins her “sketches from life” series inspired by everyday subjects. Nevertheless, Rodin, at the height of his career, would continue to discreetly support her both financially and within the art world. In late 1893, Rodin rents the Villa des Brillants in Meudon, to which he moves with Rose Beuret. He would become the owner of the property in 1895. Rodin succeeds Dalou as president of the sculpture section of the S.N.B.A. and Camille Claudel is made a member. In 1893, Paul Claudel begins his consular career. He takes up his duties as Vice Consul in New York in April, then as Deputy Consul in Boston in December. Paul’s departure coincides with the start of Camille’s separation from Rodin. In 1895, Camille Claudel receives two commissions: in January, Clotho in marble to commemorate the banquet held in honour of Puvis de Chavannes, then, in July, her first commission by the French State: The Age of Maturity. Inspector Dayot’s reports allow one to follow the various stages in the elaboration of this major work in the artist’s career. The various models are kept at the Musée Rodin. In the end, the State would not honour its commission for reasons that remain unclear. As for Clotho, this work would mysteriously disappear from the Musée du Luxembourg. S.N.B.A. : Camille Claudel exhibits Jeanne as a Child in marble (n° 20), the Bust of Léon Lhermitte in bronze (n° 21), a cast of which is kept at the Nogent Museum, Study of a Japanese in plaster (n° 22) and Confidence in plaster (n° 23). In June 1895, Paul Claudel departs for Shanghai. In 1896, Camille Claudel makes two fateful encounters: Mathias Morhardt, editor at the newspaper Le Temps, and the Countess de Maigret, who would be her main patron up until 1905. In September, she instructs Mathias Morhardt to convince Rodin to stop visiting her, so as to prove that he has no hand in the creation of her oeuvres. Art Nouveau exhibition: version of The Waltz in Muller flamed sandstone (kept at the Nogent-sur-Seine Museum). The Musée Rath in Geneva: plaster of The Gossips, drawn from a marble. A copy is kept at the Nogent-sur-Seine Museum. 1898: In March, Mathias Morhardt publishes in Le Mercure de France the artist's first biography. Camille Claudel breaks once and for all with Rodin and rents a studio at 63 Rue de Turenne. S.N.B.A. : Hamadryade (n° 35), Deep in Thought (n° 36) (a marble and bronze copy kept at the Nogent-sur-Seine Museum), and the Bust of Mr X... (n° 36 bis). 1899: In January, Camille Claudel moves to the Île Saint-Louis, 19 Quai Bourbon, her final lodgings and studio, where she lives and works in reclusion. She is in full possession of her art. S.N.B.A. : Portrait of Mr the Count of M... (Maigret) in marble (n° 26), Clotho in marble (n° 27), The Age of Maturity in plaster (n° 28) and Perseus in plaster (n° 29). In June, the commission for The Age of Maturity bronze is drafted but then cancelled for obscure reasons by the Fine Arts Director, Henry Roujon. Camille Claudel holds Rodin responsible for this setback. She meets Captain Tissier, who despite his limited means will allow for the casting of The Age of Maturity, starting with the imploring woman cast by Gruet in 1899. World's Fair in Paris: Deep in Thought in marble (n° 139), Dream by the Fire in plaster (n° 140) and Ophelia (Hamadryade) (n° 141). Salon de la Plume exhibition: Bust of Rodin, in bronze. Camille Claudel’s meeting with the merchant-editor Eugène Blot (1857-1938) through Gustave Geoffroy, around 1900, would allow for the greater diffusion of her oeuvre. Eugène Blot’s gallery, at 5 Boulevard de la Madeleine, is famous among art enthusiasts. He exhibits the great impressionist artists and himself owns a remarkable collection, with works by such artists as Carrière, Rodin, Renoir, Sysley, Monet, Pissaro and Degas. From his father, he had inherited a foundry still in operation. This encounter would prove essential for the preservation of the artist's oeuvre, given her later propensity to destroy her own sculptures during moments of anguish. Her brother Paul stays in France from January to September, then returns to China (to the city of Foochow). S.N.B.A. : Her final participation in the Société Nationale des Beaux-Arts exhibition with the life-size Perseus in marble (n° 47), Bust of the Countess de Maigret (n° 48), Alsatian, silver-patinated terracotta (n° 49), and cast of The Age of Maturity by Thiebaut Frères for Captain Tissier (kept at the Musée d’Orsay). Starting from this date, Camille Claudel exhibits her works at either the Salon des Artistes Français or the Salon d’Automne. S.A.F. : The Age of Maturity, bronze belonging to Captain Tissier (n° 2658). 1904: She befriends Henri Asselin. The Salon d’Automne: Fortune (n° 1730), cast by Blot (a copy kept at the Nogent-sur-Seine Museum). Blot casts The Flute Player (a copy kept at the Nogent-sur-Seine Museum). 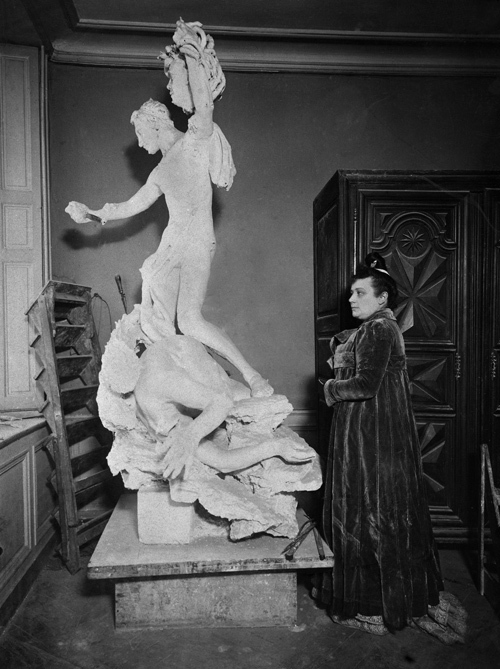 Starting in 1904, the art merchant Eugène Blot casts some fifteen bronze copies of her statues. 1905: Paul, having returned from China in April, publishes in July the article "Camille Claudel's Statuary" in the journal L’Occident. Brother and sister spend part of August together in the Pyrenees. She brings back sketches for a bust of Paul Claudel Aged Thirty-Seven. S.A.F. : Vertumnus and Pomona, marble (n° 2980) (variation on The Abandonment); The Mermaid, bronze (n° 2981). The third Salon d’Automne: The Abandonment, bronze. The Galerie Eugène Blot, from 4 to 16 December: Bernard Hoetger and Camille Claudel. Already at the first exhibition, in 1905, eleven important bronzes were displayed: Entreaty, in two sizes, Perseus, Dream by the Fire, Fortune, Intimacy, The Old Woman, The Mermaid, The Abandonment, The Waltz and The Gossips. These bronzes are displayed as part of the gallery’s permanent collection and would be regularly exhibited during group events. During the evening following the inauguration of December 1905, held at Eugène Blot’s home, Camille Claudel loses her temper and makes a scene. Her violent attitude and shocking demonstrations distance her from her loved ones and those who have remained her friends. 1906 – The artist receives a commission from the Department of Fine Arts: a bronze cast of The Wounded Niobid (entrusted to the Fine Arts Museum of Poitiers). 1906 marks the beginning of those periods characterized by the destruction of her sculptures. Paul Claudel gets married and departs for China. Final exhibition at the Galerie Eugène Blot, 1-24 December: Youth and The Age of Maturity (miniature), bronze; Entreaty, bronze; The Abandonment (Vertumnus and Pomona), marble; The Waltz, gilded bronze; Aurora, bronze; Old Man (study for The Age of Maturity), bronze; two busts of women; Perseus, bronze; Fortune, bronze; and The Inspired Woman, original marble. S.N.B.A. : Portrait of Rodin, lithograph by Hochard based on the work by Camille Claudel.